ask if there’s a better way. As we tinkered, tested and tasted, we discovered that making beer was as much an art as science (see the list of SLURK beers below). And while we respect and honor tradition, we relish the opportunity to take it further. From bringing a hoppy American twist to a Flamish Ale (SLURK De Ronde), or developing a "marine" Wit (SLURK Hav), to creating a breakthrough sour mountain beer with hand picked local arctic ingedients (SLURK Fjellbrygg). All our beers have no filtering, no centrifuge or biofining whatsoever. See the list of SLURK brews below. The Norwegian Mountains in the late summer inspired us to brew something that reflects the beautiful local colours and aromas, and made us experiment with some of the rich variety of berries and Lichen in the Hardangervidda Nature reserve. We picked Cloudberries, Juniperberries, Blueberries and collected Reindeer Lichen and some Juniper twists to make this rich mountain beer. Based on a malty Wit it’s fresh, complex and will have you enjoying what is a truly Norwegian mountain beer. IBU = 29, carbonation factor 2,6. Hops = Citra and Pacific. Yeast Belgian Wit (Mangrove Jack's #M-21), 5,6% ABV. Prepare to fall in love with a local one. Low in alcohol and bitterness yet full of flavour, this Pale Ale brings the aroma of a wild local hop perfect for a summer’s day, winter afternoon, or morning wake-up. This is the beer to drink all day long. IBU = 20, carbonation factor 2,6. Hops = wild local Føyn. Yeast WLP001 Californian Ale, 5,0% ABV. SLURK Hav, brewed again! Inspired by the beautiful scenery and direct access to fresh and exciting natural ingredients from the sea SLURK Hav has the "marine" twist, for sure. Based on our standard "Witbier" SLURK Hav was boiled with crushed oyster shells and contains sea lettuce as the ingredients that gives this beer a significant spinach and somewhat salty umamy taste. The flavor reminds us of a "Wit" where the lemon peel plays very well together with the sea lettuce giving it a fresh sushi sea weed impression. SLURK Hav pairs very well with "Lutfisk". IBU = 29, carbonation factor 2,6. Hops = Citra and Pacific. Yeast Belgian Wit (Mangrove Jack's #M-21), 5,6% ABV. Munich Dunkel style crispy dark lager with German Munich, roasted Carafa, and Pilsner malts to create a nimble, racy body, with just a hint of roast coffee. A light dry hopping of German Hallertauer Mittelfruhe hops challenges the nose before the clean and dry finish comes on the palate. Try SLURK Dunkel with dark breads, hearty meats, and sturdy cheddars (IBU = 30, Yeast SafLager™ W-34/70, 5,4% ABV). SLURK Whirled White Wheat is the first Whirlpool hopped beer we have brewed. The style is "Witbier" with a pale and cloudy appearance due to it being unfiltered. SLURK Whirled White Wheat is citrusy spiced and hopped with 1 Australian and 2 American hops: Galaxy, Citra and Amarillo. We performed the hopping in three stages: boil, whirlpool and secondary. In this way the hops give the beer a pleasant additional citrus and tropical boost. The crispyness and slight twang comes from the wheat (36%) and the lively level of carbonation (carb. level = 2.6). Great summer ale that goes very well together with white fish, green salats and chicken (IBU = 26, Yeast Safbrew Wheat (WB-06), 5,5% ABV). If you think mixing beer and fruit is for whimps, then think again! Properly balanced ‘fruit beer’ can be the perfect, refreshing beverage on a hot summer’s day. SLURK Agurk is a refreshing summer wheat beer having this fruity twist. Made with local grown cucumbers, the base is our standard-style Wheat beer. The freshly hand-cut and pulped cucumber is added during the boil and in the secondary. The flavour is subtle, not overpowering cucumber with citrusy notes. And the colour is a soft green hue of the fruit. It’s easy drinking and really refreshing. IBU 30, ABV 5,4% Carb factor 2,6. Our first rye based beer after a recipe from co-founder and brewmaster Adam Beauchamp at Creature Comforts Brewing Co in Athens Georgia USA. SLURK Rug is a complex and flavorful amber ale combining Perle hops and a Belgium Abbey style yeast strain. To add extra complexity and crispiness we decided to use a three step mash schedule with a slightly reduced temperature for the main 60 minute step. IBU 28, ABV 5,8% Carb factor 2,6. One of our favorite beers is Leffe Blonde. With its 6,6% abv. Leffe Blonde is a smooth, subtle and authentic blond abbey beer with a slight hint of bitterness. Our ode to the Leffe brewery is SLURK Blond. The smoothness and complexity is promoted by using 5 different grains, Northern Brewer and Perle hops, a Belgium Abbey style yeast strain, honey, light syrup and brown sugar and a three step mash schedule. IBU 31, ABV 7,6% Carb factor 2,6. Our second brew at our new premises! Inspired by the beautiful scenery and direct access to fresh and exciting natural ingredients from the sea SLURK Hav has the "marine" twist, for sure. Based on our standard "Witbier" SLURK Hav contains sea lettuce as one of the ingredients that gives the beer a significant spinach and somewhat salty taste. The flavor reminds us of a "Wit" where the lemon peel plays very well together with the sea lettuce giving it a fresh sushi sea weed impression. SLURK Hav pairs very well with "Lutfisk". IBU = 30, carbonation factor 2,6. Hops = Northern Brewer. Yeast Belgian Wit Ale (Safbrew #WB-06) 5,5% ABV. The first brew at our new location on Føynland! 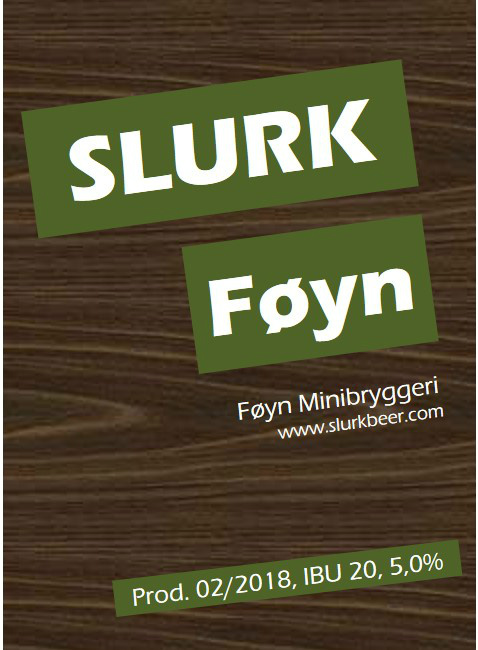 SLURK Eng, based on our standard "Witbier", is an ode to the summer on Føynland. By making use of both locally picked flowers (Meadowsweet/Queen of the meadows) and wild raspberry SLURK Eng gets this spicy, floral and a somewhat sour fruity twist. A very refreshing "Wit" for these long and warm summer evenings on Føynland. IBU = 31, carbonation factor 2,6. Hops = Hersbrucker and Amarilo, Yeast Belgian Wit Ale (Safbrew #WB-06) 5,5% ABV. Ullern Minibryggeri's last brew before we move to Føynland and change names into Føyn Minibryggeri! SLURK Weemoed is our last brew at our Ullern premises. It is a Belgian Style "Witbier". SLURK Ullern Vemod is pale and cloudy in appearance due to it being unfiltered and the high level of wheat (45%), that's used in the mash. SLURK Weemoed is slightly spiced with coriander, Curacao orange peel and lemon peel. The crispness and slight twang comes from the wheat and the lively level of carbonation (carb. level = 2.6). Great summer beer (IBU = 26). Hops = Saaz 15 IBU, Galaxy 13 IBU + dry hopping and Citra dry hopping. Yeast Belgian Wit Ale WLP 400, 4,6% ABV). SLURK Ozzie Pale Ale is our first batch pale ale using Australian Galaxy hops. Galaxy is a high alpha, dual purpose seedless hops with a unique hop aroma. In this pale ale we used it for both bittering as well late hop addition and dry hopping to provide a flavor of citrus and passionfruit to the finished beer. The combination with Cascade hops gives Ozzie Pale Ale an extra spicy, floral, grapefruit twist. We gave the hops an extra malty backbone and pimped it with some extra alcohol. IBU=40, ABV=7,4%, YeastEnglish Ale WLP 002, Carb.level 2,6. SLURK Witness is the third batch in a series of three Belgian Style "Witbier". SLURK Witness is pale and cloudy in appearance due to it being unfiltered. SLURK Witness is citrusy spiced with sweet and bitter orange peel, lemon peel, lime and the use of 2 American hops: Citra (25 IBU) and Amarillo (5 IBU + dry hopping). These hops give the beer an additional citrus and tropical boost. The crispness and slight twang comes from the wheat (40%) and the lively level of carbonation (carb. level = 2.8). Great summer ale that goes very well together with white fish, green salats and chicken (IBU = 30, Yeast Belgian Wit Ale WLP 400, 5,1% ABV). SLURK Witter is the second batch in a series of three Belgian Style "Witbier". SLURK Witter is pale and cloudy in appearance due to it being unfiltered and the high level of wheat (50%), that's used in the mash. SLURK Witter is slightly spiced by the use of 3 hops: Fuggles 19 IBU, Hersbrucker 9 IBU + dry hopping and Citra dry hopping. The last hop gives the beer a citrus and tropical character. The crispness and slight twang comes from the wheat and the lively level of carbonation (carb. level = 28). Great summer beer that goes very well together with shrimps, white fish and shells (IBU = 2.8, Yeast Belgian Wit Ale WLP 400, 5,1% ABV). SLURK Wit is the first batch in a series of three Belgian Style "Witbier". SLURK Wit is pale and cloudy in appearance due to it being unfiltered and the high level of wheat and oats (45%), that's used in the mash. SLURK Wit is slightly spiced with coriander, Curacao orange peel and lemon peel. The crispness and slight twang comes from the wheat and the lively level of carbonation (carb. level = 2.8). Great summer beer! IBU = 28, Hops = East Kent Goldings 23 IBU and Hersbrucker 5 IBU + dry hopping , Yeast Belgian Wit Ale WLP 400, 5,6% ABV). SLURK Ullern Red is a balanced, easy-drinking Irish red ale, with a moderate though complex malt character full of caramel and toasted notes. The deep reddish copper color comes from both crystal malt and a small dose of Carared. Despite a slightly sweet overall character, the selected grains in combination with the choosen yeast add a touch of dryness to the finish and adds a very slight touch of roasted flavor too. Hop bitterness (IBU = 28) is evenly balanced with the choice of malt additions. Hop flavor and aroma is not prominent, but a touch of hop character is noticable (50% Fugles and 50% East Kent Goldings). The beer is brewed as an ale, but with a clean fermentation character (Irish Ale Yeast WLP004 - 5.2% ABV).